This article is for people that use IP Cam Viewer to record their cameras 24x7 and also have a smartthings hub. 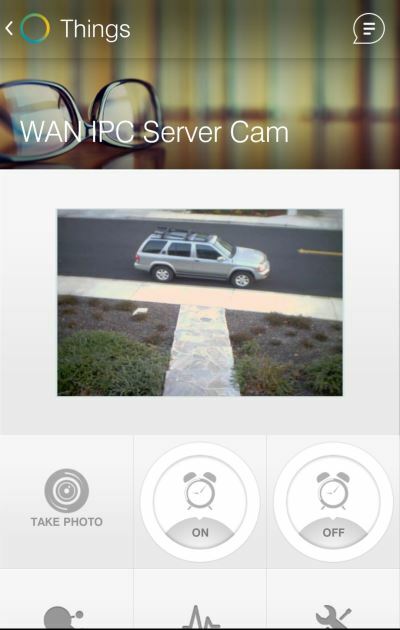 I use IP Cam Viewer on a spare android device to record 2 groups of cameras ("record away" and "record home"). 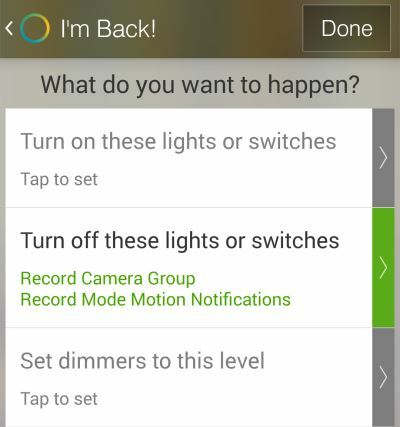 When I'm at home, I record the "home" group and have motion notifications turned off globally (see Record Settings). When I leave, I change to the "away" group (which records more rooms) and turn on motion notifications globally (although each camera can override this, see each camera's More Options screen). 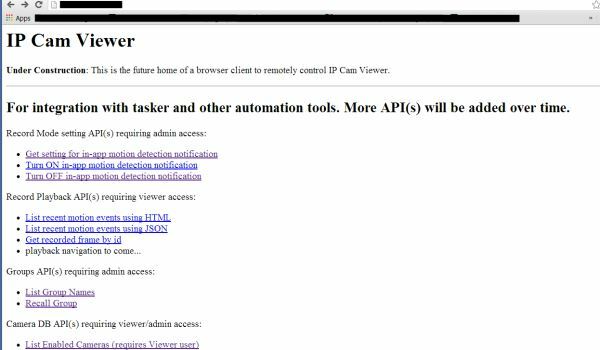 You probably know that IP Cam Viewer has an embedded web server that allow you to turn MD on/off and recall groups away from home with just a browser. However, the web interface is bare metal right now (I'm building it up still). Great for integration though. If you have a smartthings hub, this article will help you automate the above steps into the Smartthings app. You get GUI buttons to turn motion notifications on/off and buttons to switch camera groups. In addition, you can configure smartthings to automatically turn MD on and switch to an "away" camera group when you leave and then reverse when you get home. Finally, you can add any camera supported by IP Cam Viewer into SmartThings via the app's embedded web server. 1. You have IP Cam Viewer running in record mode and you can already bring up the embedded browser interface. 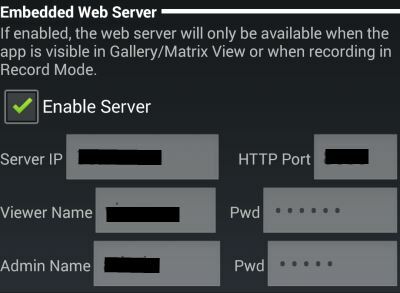 - goto App Settings to see the IP and Port used by the embedded web browser. - App Settings is also where you set the viewer and admin name/password for the embedded web server. 2. You have smartthings hub already setup with their mobile app. - get familiar with their app, try to setup so a light goes on when away and off when home. - click Publish and select "For Me"
- Type: scroll to the bottom of the list and select "IP Cam Viewer Record Mode Motion Notifications"
- you can turn md on/off just like the ide. Great. If you only have one group of cameras to record, then you're done! If you want to record a larger set of cameras when away, then continue below. - Type: scroll to the bottom of the list and select "IP Cam Viewer Recall Camera Group"
- you can turn it on/off to recall the camera groups just like the ide. You are done. 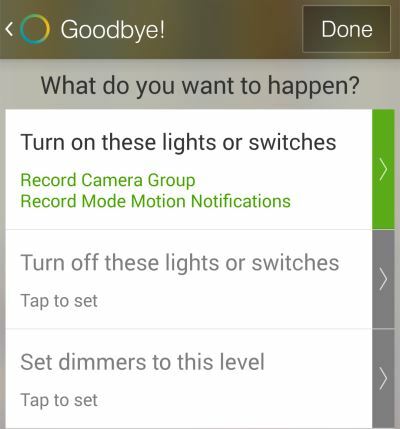 Switching between "away" and "home" modes in smartthings will automatically turn IP Cam Viewer's global motion notification setting on/off and recall the proper camera group for recording. - Capabilities: select "Image Capture", "Switch", "Actuator"
- Type: scroll to the bottom of the list and select "WAN IPC Server Cam"
- in the tile, click the settings and then click Take Photo to show current frame (just like in IDE). ps. Future article will show you know to integrate ANY camera supported by IP Cam Viewer into smartthings. You could then automate smartthings to take a snapshot when some event takes place. Anyone knows what could be possibly wrong.